Mix pastry ingredients till crumbly, add ice water into it and knead to become a dough. Shape it into ball and wrap it with aluminium foil. Put dough in freezer for about 15 minutes. Roll the pastry dough flat into about 3mm thickness between two plastic sheets. Use a round cutter to cut dough and place it into tart mould. Press the dough evenly in mould and trim excess dough with a sharp knife. Prick some holes with a fork to release air from the pastry and place the tart moulds in the freezer for another 10 mins or for a day or two. Take out tart moulds from freezer, line with aluminium foil and blind bake medium size tarts for 30 minutes and mini size tarts for 20 minutes at preheated oven 180C. Remove aluminium foil immediately from tart moulds after baked and leave tart pastry to cool. Wash and scrub sweet potato and steam at high heat till soft. Add sweet potato paste into the whipping cream and mix to combine to sweet potato cream. Add sweet potato cream into a piping cream and pipe into tart shells. Chill for 30-60 mins to let cream set. Spoon the remaining sweet potato paste into a piping bag and pipe on top of sweet potato cream. 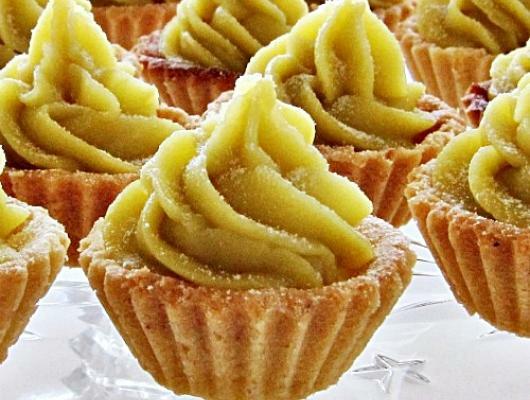 Chill sweet potato tarts and dust some icing sugar or snow powder before serve. 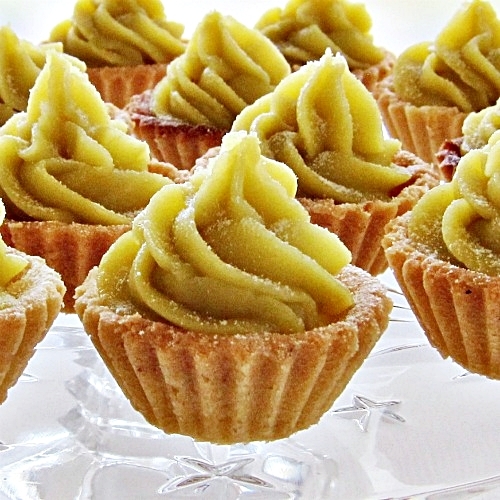 Sweet potato tarts can be also served immediately. Here is another interesting recipe that I got from a newspaper cutting. The Japanese French dessert Chef Tomoko is from the famous bakery shop Patisserie Glace in Singapore. She uses the root vegetable sweet potato to make an ever-popular French Classic Mont-blanc. As I like to snack on sweet potato, I definitely do not wish to miss out this yummy dessert and made it into tarts instead. The sweet potato cream and paste turned out so well that I kept digging the filling with a spoon and tasted it even before piping it into the tartlets. The smooth and creamy blended sweet potato just melted in my mouth in seconds .... so yummy! I'll definitely be making this again.